This great promise given by God in the Garden of Eden is known as the Protevangelium, the “first gospel.” Scholars debate whether Adam and Eve would have recognized this as the first anticipation of the coming Christ, but the Messianic overtones are unmistakable to believers today. Nevertheless, Adam and Eve knew their willful rebellion shattered the perfect relationship they had enjoyed with their Creator and ushered in our current world of sin, death, and decay. But thank God, even in the midst of pronouncing the Curse, He lovingly offered a resolution! The concept of the “seed of the woman” is particularly noteworthy because it is unique in all of Scripture. Biologically, women produce no seed, and except in this case the biblical usage speaks exclusively of the seed of men. Thus, the seed of the woman can only refer to the future descendant of Eve who would have no human father. Moreover, such an extraordinarily special Seed would have to be miraculously embedded in the womb and would therefore bypass the innate sin nature that “entered the world” through Adam and “spread to all men” (Romans 5:12). Yet, the absence of a sin nature would not spare this Seed from encountering “the sin which so easily ensnares us” (Hebrews 12:1). Indeed, He “was in all points tempted as we are” but lived a perfect life “without sin” (Hebrews 4:15). And in the process of time, this Seed, who temporarily set aside the power and authority of His deity to come “in the likeness of men,” willingly “became obedient to the point of death, even the death of the cross” (Philippians 2:7-8). Consequently, only this perfect and sinless Seed could become the “propitiation for our sins, and not for ours only but also for the whole world” (1 John 2:2). At Calvary, “that serpent of old, called the Devil” (Revelation 12:9) inflicted a painful wound on the woman’s Seed and must have rejoiced greatly as His body was laid in the tomb. But having “suffered once for sins,” the long-promised Seed was “made alive by the Spirit” (1 Peter 3:18) and inflicted a mortal wound on the serpent by rising again the third day! And having conquered both sin and death, the Seed fulfilled the prophecy first promised by God in the beginning soon after creation. It is this great Seed of promise we honor and worship at Christmas. 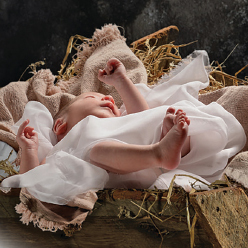 He is so much more than a babe in the manger; He is the very Creator Himself who “was with God” and “was God” who made all things (John 1:1-3). And it was this same Creator who walked “in the garden in the cool of the day” (Genesis 3:8) and knowingly foretold the necessity of His own death for you and for me. From the very beginning, God graciously showed His great love for us, and “according to the promise, [He] raised up for Israel a Savior—Jesus” (Acts 13:23). It is vitally important we do not forget exactly who went to the cross for us. The Lord Jesus Christ—revealed in Scripture as our Creator, Savior, and coming King—is the singular focus of ICR’s work, and the coming ICR Discovery Center will demonstrate the truth of His magnificent handiwork. Please join us this season with your gifts of support and help us proclaim His gospel to the coming generations. Cite this article: Henry M. Morris IV. 2017. The Seed of Promise. Acts & Facts. 46 (12).